May 10, we released RebelBetting 4. These are the new features! We have completely re-written the code that we use for discovering and calculating arb opportunities. Other arb services statically define arb combinations (such as defining that Over 2.5 combined with Under 2.5 can produce an arb). Our servers dynamically finds arbs despite what the amount of goals, what the Asian Handicap or the European Handicap is for the specific match. For instance, if a bookmaker offers a bet that’s Under 189.5, EHX(-2), AH1(+1.25) or whatever, our servers will crunch through tens of thousands of odds and check if they can be combined in any way to produce an arb. Our servers have currently found over 10.000 different Cross Market combinations! 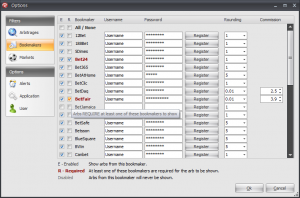 4 new bookmakers have been added. 5Dimes, BetClic, Dafabet and Betoto. 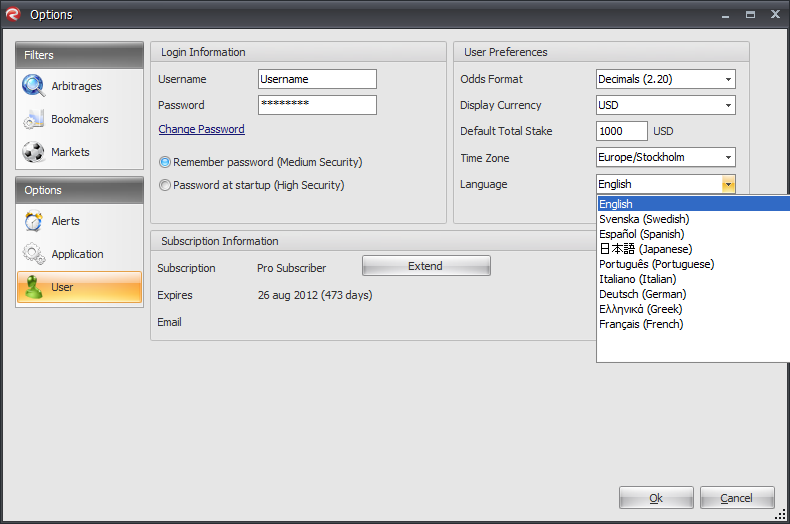 You can now chose between several different languages when running RebelBetting. Currently supported languages are English, Swedish, Spanish, Japanese, Portuguese, Italian and Greek. Coming soon are German, French, Russian, Polish and Serbian/Croatian. Sometimes you might want to hide a specific odds, a specific arb, or all arbs for a specific match. This can now be done by right-clicking on the odds (to hide the odds) or arb row (to hide the entire arb)! In the screenshot above, the odds 1.85 @ Betsafe has been right-clicked. 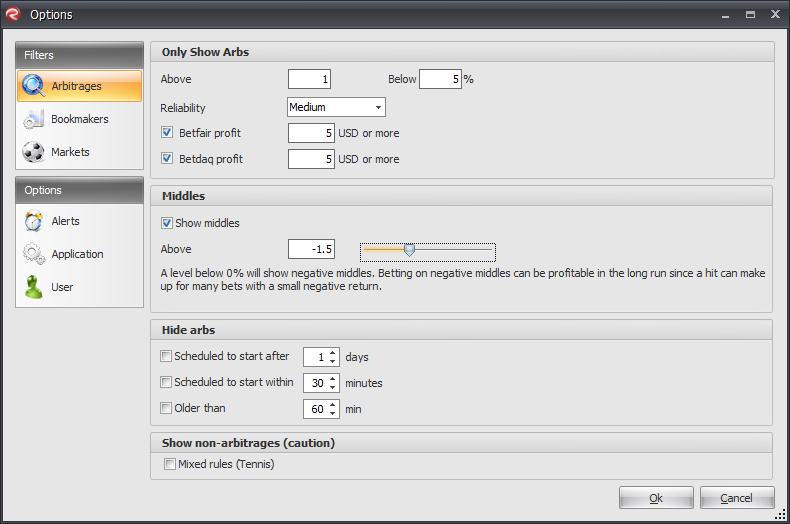 Choose Selected arbitrage to hide the entire arb, All arbitrages for selected match to hide all arbs (all different arb-types) between Lugano-Servette or All arbitrages with selected odds to hide only the Betsafe odds. You can now select to show one or more bookmakers that must be in an arb. 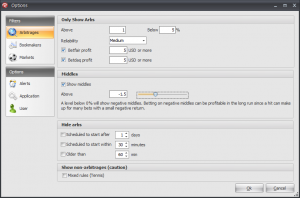 This is very useful when you are for instance rolling over a bonus at a specific bookmaker, or are planning to decrease your commission percentage at Betfair. Just open up Options – Bookmakers and tick your required bookmaker of choice. You can choose to hide arbs from Betfair and Betdaq that have low profitability. Read more about this filter here. We’re sure that you will enjoy the new version of RebelBetting, but we haven’t stopped there – we’ve already started on RebelBetting 4.1! Feel free to contact us if you have any questions or comments. Your input is important to us! Happy arbing from the RebelBetting crew!